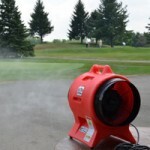 Springville, NY—Based on the popularity of the BUFFALO TURBINE Debris Blowers and Sprayers, Paul Syracuse, General Manager of BUFFALO TURBINE LLC is pleased to announce the newest addition to their product line, the BUFFALO TURBINE Monsoon Compact Fan Assisted Misting System. The Compact Fan Assisted Misting System will be utilized for evaporative cooling at golf courses, country clubs, sports fields, stadiums and outdoor banquet facilities. Cooling with a fine mist is increasing in popularity for athletes, employees and customers and will offer much relief on hot, dry days. This misting system is lightweight and portable and can be used to lower the canopy temperature of sensitive turf areas, like golf greens in areas where heat stress is very high. The Monsoon Compact Fan Assisted Misting System utilizes a proprietary high speed rotary atomizer and can distribute a fine mist of water in excess of 50 feet. The Misting System does not utilize small nozzle tips and is not prone to plugging. Requiring very little maintenance this compact system is lightweight, portable and has a standard 110 volt plug along with a ¾” garden hose connection. This system is very affordably priced and is very easy to maintain. Dealer inquires for these products are welcome. For more information on this product and the full line of Buffalo Turbine Monsoon Misting Systems please contact www.buffaloturbine.com or email us at info@buffaloturbine.com.